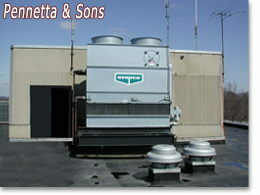 Pennetta and Sons is a family-owned New Jersey company of mechanical contractors. Established in 1970, Pennetta and Sons is the number one company in its field serving all of New Jersey for over thirty years. No matter how big or small the job, our highly-trained technicians will handle it expertly from start to finish because we have the necessary expertise in every required field and department. From the demo work, installation, and right through to the start-up, we provide our own, inhouse, highly experienced and trained engineers, draftsmen, mechanics, supervisors, installers, servicemen. We can do it all and it is this all round competency which is the foundation of our success as mechanical contractors and the foundation of three decades of customer satisfaction. And with our 24-hour emergency service, Pennetta and Sons will never leave you out in the cold! Most of the work we do is for schools, hospitals, municipal buildings, factories, churches, universities, office buildings, warehouses, laboratories, jails. However, our work includes all types of buildings for towns and counties (police deptartment buildings, town halls, DPW, fire department builidngs, etc.) 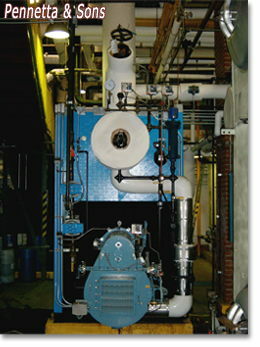 Our work ranges from commercial to industrial and institutional. Pennetta and Sons have the experience and know-how as long-standing mechanical contractors to expertly install and service any hardware brands of your choosing. You name it, we've installed it and we can service it. In particular, Pennetta and Sons are the chosen representatives for Automated Logic Corporation (an automated temperature control company), John Zink and Gordon Piatt (burner companies). 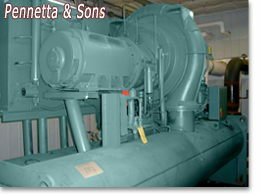 Pennetta and Sons have been in business as mechanical contractors since 1970 serving the customers of New Jersey with a reliability they can trust. Our work is done with care and professionalism. We take great pride in our work and this pride and professionalism is reflected in the success of our projects and thirty years of customer satisfaction in New Jersey.